With 20 years of expertise from our own research and development, we have been a premium partner and series supplier of high-quality magnetic products for the industry for 10 years. Magnetworld AG has been ISO 9001 certified since 2009 and ISO 140001certified in environmental management since 2013. We achieve our customer's price performance requirements with the optimized processes and resources worldwide. The North Pole symbolizes for Magnetworld inspiration. in cooperation with our customers. The South Pole is for Magnetworld precision. Precision of quality magnets and systems, which are exactly oriented and measured. Professional and customized we deliver from pilot to series. 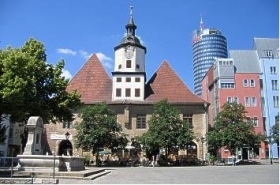 Jena with its 100,000 inhabitants is known as the so-called “lighthouse” (or leading city) in Eastern Germany. Aside from the only full university, the Friedrich-Schiller-Universität Jena, offering all academic disciplines, Jena has the largest university for applied sciences in all of Thuringia. It also has other well-known institutes including 4 different Max-Planck Institutes and the Fraunhofer Institute, as well as the most well-known Thuringian enterprises: such as Jenoptik, Zeiss, Schott etc. Our company is located in the midst of this network of science and industry. Recent technological developments can ideally be directly coordinated and promoted "on the doorstep". In this connection partnerships with industry converters ideas become projects.